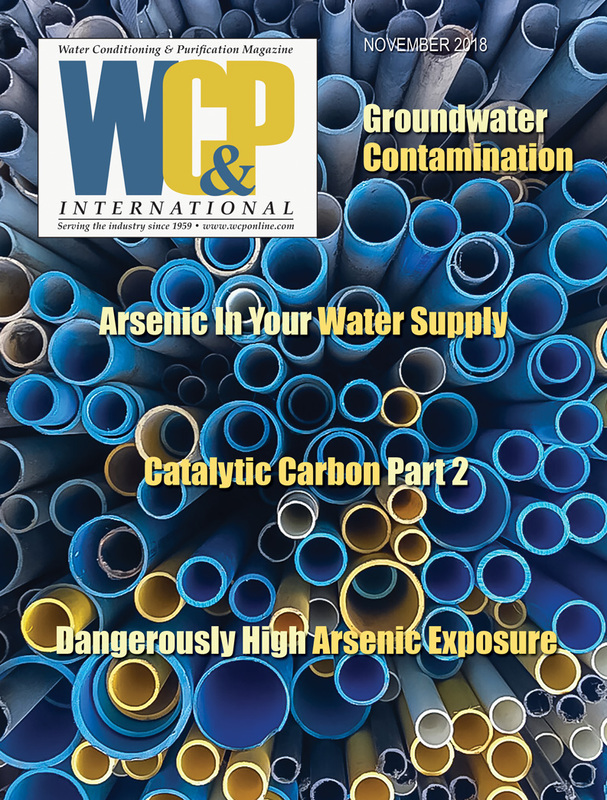 In WC&P’s annual international edition, we frequently look outward at water quality issues in developing nations, sometimes with the patronizing perspective of our first-world privilege. Enjoying all the conveniences of modern American life makes it easy to forget that we can encounter the same challenges and threats as our colleagues in developing nations. The difference is that we have easy availability of technology, funding and other resources to address them. Algae, mold, bacteria and other organisms are commonly found in surface water. An entire sphere of our industry’s expertise is devoted to cleaning surface water sources and making them fit for human consumption. Conventional logic asserts that surface water contains far more contaminants than groundwater; and this can certainly be the case since groundwater has typically percolated or filtered through non permeable material that acts as a filter and clarifier. In fact, for many years, the water industry has considered groundwater to be generally safe from bacterial contamination. 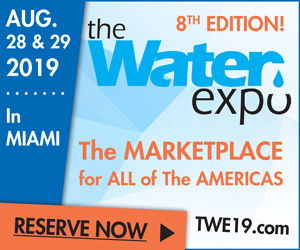 An estimated 130 million Americans drink, bathe and work with ground-sourced water every day, much of it from municipal and community supply systems that are supervised by professionals to ensure it meets the minimum quality standards specified by US EPA. About five million privately owned wells serve another estimated 40 million users who don’t have access to the same daily professional oversight. US EPA’s regulatory guidelines for drinking water are carefully designed to maximize protection of human health, while also minimizing the cost and effort of delivering water. These legally enforceable guidelines address microorganisms, disinfectants, DBPs, inorganic and organic chemicals and radionuclides. 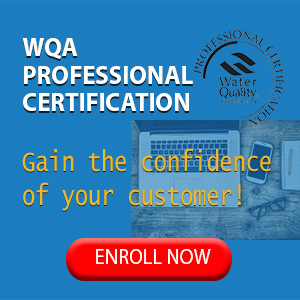 This minimum water quality standard is a good start and can certainly be credited with helping Americans live longer and better lives than ever before. sewage and animal waste, which can cause gastrointestinal illness. a type of pneumonia known as Legionnaires disease. and stool of infected persons. gas when incubated at 35 to 37°C. the replicated viruses to contaminate new hosts. There are millions of other organisms that can exist in and around our groundwater, many of which are not culturable using traditional agar plating techniques. We already know that rotovirus and norovirus travel in well water and some academics are speculating that many other viruses, such as the cancer-causing oncoviruses, will evolve to travel freely in water or hitch a ride with waterborne bacteria. This is a matter of great concern to those of us who are trusted by our clients to keep their water safe, useful and aesthetically pleasing. Many water treatment system dealers know a little about some pathogens and have heard a little less about nuisance bacteria and very few understand the overall holistic of controlling microorganisms in water. It’s time to learn more about bacteria and its impact on water, infrastructure and health. Bacteria are some of the most ancient organisms known to exist on our planet and many extremophilic strains can survive in extreme conditions of chemistry, temperature and pressure. Bacteria can even survive dehydration, be carried by wind or water and lay dormant for years before being reactivated under the right conditions to sustain their lifecycle. Aerobic bacteria thrive in oxygen rich environment and those that thrive without it are known as anaerobic bacteria. Bacteria are prokaryotic organisms that reproduce asexually. Bacterial reproduction most commonly occurs by a form of cellular division called binary fission, which results in the formation of two bacterial cells that are genetically identical. As the first living step in the food chain, bacteria are phenomenal energy transformers; they live by interacting with their environment and utilizing various metals, minerals and organics as food. They then excrete their metabolic byproducts, which can take a number of forms, including enzymes, gases, acids and chemical compounds. Bacteria are not all necessarily bad; we use beneficial bacteria to produce salami, yogurt, cheese, sauerkraut, beer, wine and other fine foods as well as manufacturing vitamin products, sweeteners, construction materials and a host of other modern conveniences. Our bodies also rely on beneficial bacteria to live and function properly. Without bacteria, we would simply cease to exist. There is a significant amount of research into beneficial bacteria that can be used for wastewater treatment, bioremediation and even water purification for drinking. Until we fully understand the benefits and risks of non-pathogenic bacteria and other microorganisms in water, the most sensible approach is to prevent all microorganisms from growing in the plumbing systems that we are tasked with protecting. Bacteria exist in all healthy soils, so it is no surprise that even groundwater from the deepest wells can contain bacteria and other living organisms. As testing and technology improve, we are finding more and more living organisms in places that we never expected to find them. Recent sampling in South Africa’s Mponeng mine found waterborne bacteria (Desulfotomaculum) more than two miles below ground within rock strata, living happily on sulfates and hydrogen gas, while metabolizing hydrogen sulfide (H2S) into the water with the aid of ambient uranium radioactivity. This is not an isolated case, but thankfully, deep-water bacteria found in strata and aquifers will usually fit into the category of nuisance bacteria and are not expected to be directly pathogenic. The next step of vulnerability is at the storage and distribution infrastructure, where atmospheric tanks are frequently improperly sealed, exposing them to airborne bacteria, mold and fungus, as well as ingress of insects such as Chironomidae, whose larvae (known as bloodworms) will grow in the tank and find their way into homes and businesses causing significant problems. Plumbing repairs and replacements made without proper sanitation will also compound bacterial problems. These pathways to infection can be significantly reduced by implementing a proper maintenance program and of course, by following current industry best practices, such as those in the WQA’s new Modular Education Program (MEP) for installers and service technicians. It is wise practice to always incorporate bacterial control for homes and businesses served by private water sources. A proclamation of safe from the lab is no guarantee that there are no other living organisms in the water, merely the reassurance that the sample screened for a particular strain of regulated pathogen is negative; that is simply not enough for me. With the ongoing threat of emerging contaminants, an increased level of client awareness of waterborne contaminants and ever-shrinking public-utility budgets, it makes sense to install ultraviolet and/or final-barrier systems wherever feasible. Many in our industry view ultraviolet irradiation as a tool to be used only when pathogens are suspected to be in water. This is shortsighted, since 254 to 285 nm UV radiation can be effectively used to photochemically damage and destroy the DNA of most waterborne organisms and viruses; in fact, it is a far more potent virucide than free chlorine. UV radiation has also been proven to be just as effective as chlorine in controlling heterotrophic plate count bacteria (HPCs) and most protozoa. 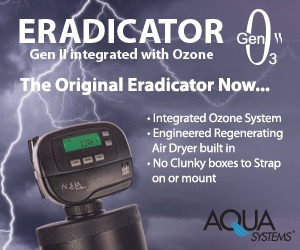 When used in combination with ozone, ultraviolet radiation is extremely effective against all living organisms, pharmaceuticals, petrochemicals and endocrine-disrupting organic compounds. Modern UV systems are so much more cost-effective and easy to maintain than their outdated ancestors, that I recommend installing a 254-nm UV radiator on every home after their softener for increased peace of mind and better water quality. A best practice for installation of ultraviolet disinfection equipment in concert with a multimedia filter and water softener for wholehouse protection is shown in Diagram 1. To learn even more, stay tuned for my upcoming article about ultraviolet systems, consult the reading references below, enroll in WQA’s MEP and discuss it with your mentor. 1. Balkwill, D.L. 1989. “Numbers, diversity and morphological characteristics of aerobic, chemoheterotrophic bacteria in deep subsurface sediments from a site in South Carolina.” Geomicrobiology Journal, 1989, vol. 7, pp. 33-52. 2. Chapelle, F.H. 1993. Ground-water microbiology and geochemistry, John Wiley and Sons, New York. 3. Fyfe, W.S. “The biosphere is going deep,” Science, 1996, 273:448. Geldreich, E.E. “Microbiological quality of source waters for water supply,” 1990, pp. 3-31 in G. A. McFeters (ed.) Drinking Water Microbiology: Progress and Recent Developments, Springer-Verlag, New York. 4. Madsen, E.L. and Ghiorse, W.C. “Groundwater microbiology: subsurface ecosystem processes,” 1993, pp. 167-214 in T.E. Ford (ed.) Aquatic Microbiology, Blackwell Scientific Publications, Boston. 5. Norris, R.D. et al. Handbook of Bioremediation. US EPA Robert S. Kerr Environmental Research Laboratory. Lewis Publishers, Ann Arbor. 6. Onstott, T.C. et al. Enigmatic Microorganisms and Life in Extreme Environments, J. Seckbach, Ed. (Kluwer Academic, Dordrecht, Netherlands, 1999), pp. 489-500.